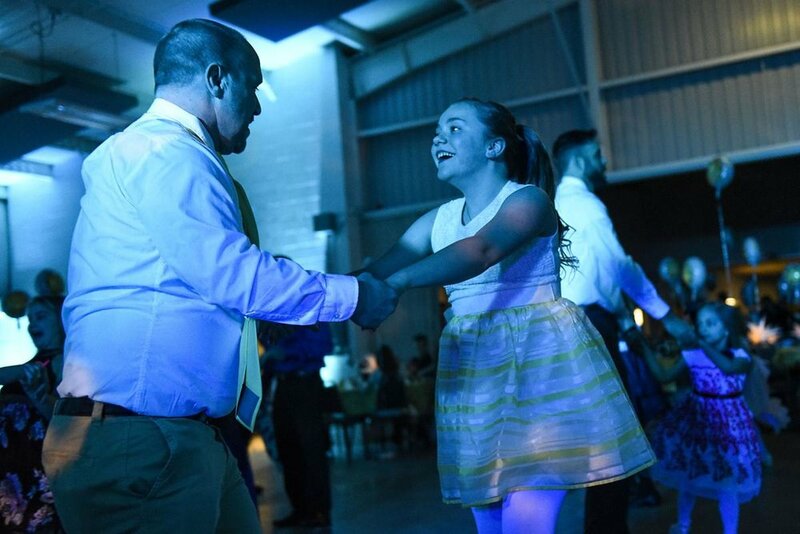 Nearly 600 dads and their little princesses got together in Goshen this winter for one of our favorite Valentine events to do each year, the annual Park Department Daddy-Daughter dance. The theme for this elegant evening out was “You Are My Sunshine” with bright blue and yellow decorations, food, punch, and memory photos for all who attended. The ECCC building at the Elkhart County 4-H Fairgrounds looked amazing with our up lights bathing the room in baby blue light to complement the theme, and later in the evening, changing colors to the music to add energy and excitement.DJ Sticky Boots rocked the kids with tons of upbeat fun music, and interactive dances including the Cha Cha Slide, Cupid Shuffle, Whip & Nae Nae, and of course Baby Shark.It was a super-fun night for all involved, with thousands of memories made a permanent smile on the face of every little girl who participated.